My Australian Job is an online recruitment platform created by the French-Australian Chamber of Commerce & Industry (FACCI), in collaboration with the French Trade Advisors (CCEF) & BUSINESS FRANCE, under the patronage of the Embassy of France to Australia. Since the creation of My Australian Job, over 3200 job seeker profiles and 500 recruiters have been added to our user base. Even better, numbers are increasing at a rapid pace with 150 new accounts every month. As a result, there are even more exclusive job offers for job seekers and more highly qualified candidates for recruiters from every sector. Quick and easy applications, by saving your resume and jobs that interest you. Stay up to date about new positions with job alerts. 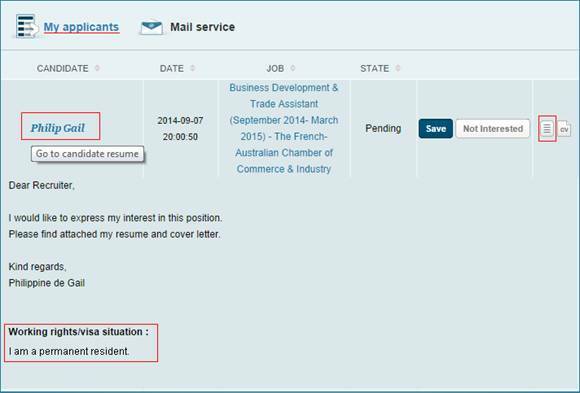 Be listed on the FACCI profile database: as a candidate user on My Australian Job, you will automatically be listed on the profile database of the Recruitment Services of the French-Australian Chamber of Commerce & Industry and benefit from unique job opportunities from the employers hiring these services. A low cost solution for French companies in Australia, with no restriction on what position, unlike a Sponsorship visa. French Companies or French administration wanting to develop their business in Australia. French job seekers under 29 years old who can be granted a 2 year Australian working visa through the French Trade Commission: Business France. Recruiters, to benefit from this program find French job seekers in Australia with the help of My Australian Job, which provides information about candidates nationality, skills and age in order to find out if they are suitable for this program. By advertising on My Australian Job your business can benefit from its active and extensive web traffic. Our recruitment platform has been created for job seekers and small to large French and Australian companies seeking qualified staff in a diverse range of industries, including: Accounting & Finance, Education, Construction, Engineering, Government, Sales & Marketing, HR, Information Technology, Manufacturing & Operations, Mining, Resources and Energy, Office Support and Transport & Logistics. Recruiters & Employers, we wish you all the best with your future searches for employees. Service Providers, thank you for offering your services to our users. Job seekers, good luck with your professional career opportunities in Australia. The Team at My Australian Job.